Sony’s online store probably received a record-breaking amount of visits yesterday after word broke out that several cameras and lenses were listed for as low as $200. Expecting the orders to be cancelled, many people placed them anyway in hope that the company will honor the listed prices and absorb the price difference. In a rare incident were a camera company actually met its customers’ expectations, Sony has started cancelling orders. It seems like PayPal orders have not been cancelled so far. Initial reports stated Sony’s online store has the a7R listed for just $199.99 instead of $2,299.99, leading people to believe that someone had made a mistake. A deeper look, however, reveals that several other products, including the a77II were listed for ridiculously low prices. With so many product prices being slashed, it seems increasingly likely that a (very) disgruntled worker or a hacker attack is behind this. The largest price reduction was on the 500mm f/4 telephoto lens which was advertised for just under $1,300 – a full $11,700 off its regular price! Zeiss Uploaded More Photos Said To Be Taken With the Sony A7R II; Are The Companies Working Together? Zeiss made unexpected headlines a couple of weeks ago when it seemed to have revealed the upcoming Sony A7r II with a 56+ MP sensor. The company uploaded more sample photos of their new Batis lens yesterday and while the EXIF data was completely removed, the photo captions stated they were taken with the Sony A7r II. The camera model was edited once readers excitedly pointed out that Zeiss was in possession of the yet-to-be-announced camera. Is Zeiss working with Sony to promote their new products? We have previously reported about Sony’s upcoming high-megapixel sensor. The sensor was said to pack a whopping 46MP, but would still fall behind Canon’s rumored 53MP beast. 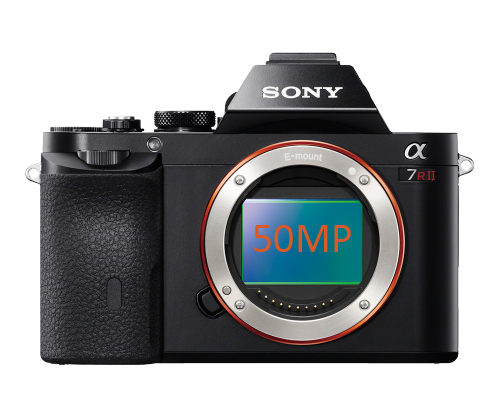 Sony Alpha Rumors now reports that according to a “long time source”, the upcoming Sony a7RII will also enter the 50MP club.